Howard Hughes Appliance, Television & Sleepshop is Moscow's largest retailer of major appliances -- and one of Moscow's oldest established businesses, with roots dating back to 1960. The owners Don Frei and Kevin Peterson boast not only the area's best selection of quality name brand major appliances, they also have the area's only in-store appliance service department. In addition to major appliances, they offer their customers the best and latest in televisions, and a vast selection of beds by Englander and Tempur-pedic. Their store is a member of AVB Brand Source, one of the nation's largest buying groups, which allows Howard Hughes Appliance to offer pricing that is very competitive with other dealers, including those dealers in the Spokane area. With great prices on major brands such as Whirlpool, Frigidaire, Bosch, LG, Jenn-Air, Amana, Toshiba, JVC, Panasonic, Fisher & Paykel, and Kitchenaid, just to name a few, there is no reason not to "Buy Local Moscow." 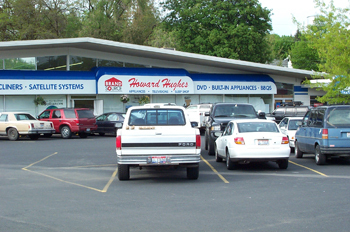 Visit our showroom, and you will see why Howard Hughes Appliance, Television & Sleepshop is the very best place to buy.